Today has been quite a busy day. A long line of storms, many severe, ran from New England all the way to Texas. The storms produced high winds, hail, and a tornado that was reported in Elmira, New York. 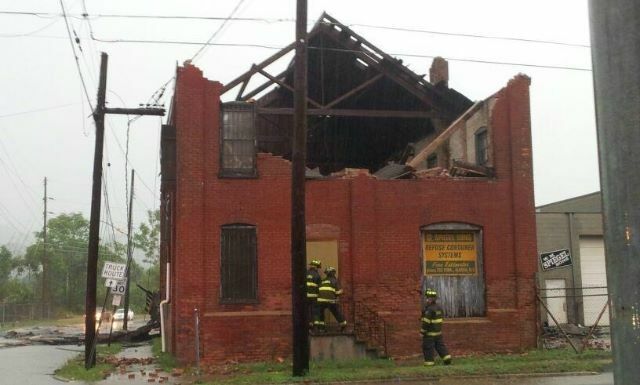 This building in Elmira, NY was damaged today by the severe weather. The storms reportedly spawned a tornado, but the National Weather Service is yet to confirm. The long line of storms ran along a cold front, a normal occurrence during the summer. But why cold fronts? What about warm fronts? First, lets look at a radar/satellite image from this evening and compare it to a weather map from roughly the same time. This radar/satellite shows a long line of precipitation, heavy at many spots, from New England to Texas. This weather map, produced by the National Weather Service a few hours before the above radar image, shows a long cold front that matches the location and orientation of the line of storms. The line of storms is right at or just in front of the cold front. Cold fronts are conducive to storms because of their structure. A cold front marks the leading edge of an incoming mass of cold air into an area of warmer air. Cold air is denser than warm air, so a cold front moves along the surface like a bulldozer. The warm air ahead of the front is forced to rise. Yesterday I mentioned that rising air is needed to form clouds and this is no exception. Warm, often moist air rises quickly over the front and the water vapor condenses into clouds. With enough lifting and enough moisture the clouds can grow into cumulonimbus clouds and a thunderstorm is born. A cross-section of a cold front. But what about the warm front? They are also marked by clouds but less rain, typically showers or drizzle. This is because the warm air behind the front is less dense than the cooler air it’s trying to replace. Once again the warm air is lifted above the cold, but this time it is a much more gradual process. While there is enough rising motion to create clouds and some rain, the gradual slope of a warm front makes storms far less likely. Cross-section of a warm front. While cold fronts are typically quite obvious, the exact location of a warm front can be hard to pinpoint, even for meteorologists. For a skywatcher, high cirrus clouds followed by stratus clouds are usually a good predictor of one’s approach. Don’t be surprised if you see fog either. These images came from Fundamentals of Physical Geography, 2nd Edition. by M. Pidwirmy. The chapter covering fronts can be seen here http://www.physicalgeography.net/fundamentals/7r.html. If you have any questions please ask. If I don’t know the answer I’ll do my best to find it. FYI wildcard weather is on twitter @wildcardweather !!! !